Out There is a Phoenix based band who’ve just issued their third album, and with a twist. Due to my past contact with singer Stephen “Steff” Fontaine, who was at one time (1986), singing for Uriah Heep, and who had sang on the classic AOR album by Joshua “The Hand Is Quicker Than The Eye” (1982) – Kirk Krein contacted me with news of this release. Kirk is the band’s bassist, keyboard player and backing vocals [on this release]. 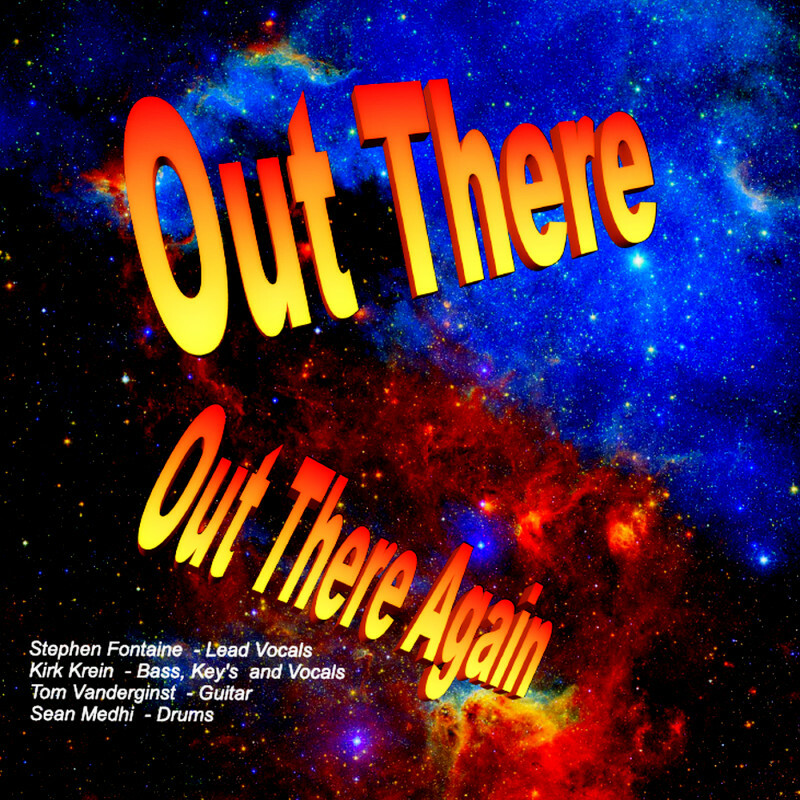 Out There Again also features Tom Vanderginst on guitars and Sean Medhi on drums. Out There Again is a good mix of hard rock, mixed with acoustics moments, giving this album a nice blend of songs and styles. I must say that hearing Fontaine on this album really stood out, as [aside from the Joshua album] much of what Fontaine has done over the years has been pretty ‘heavy’ metal [2001’s Heartache City release included], but here there’s less ‘metal’ screams and just more good singing. Highlights include the acoustic opener “Apocalypse”, the ballad “Caught In A Dream” – acoustic guitar, organ, and a great vocal [love the guitar break as well]. and “Cruizin Down The Highway” – which rocks, and features a cool guitar solo and backing vocals. Although there’s 3 covers on this album, I prefer the originals, these guys got some really cool songs; my only criticism is they don’t allow themselves to ‘stretch out’ with lengthier solos and keyboard passages, but this is definately a great intro to the band and hopefully there’ll be more and bigger productions to come! In this interview with Kirk Krein gives some recall on the ‘old’ days on the Phoenix rock scene, as well as details of the band’s most recent project. What was typical set list or genre of bands you guys would cover? KK: Alien covered Ted Nugent, Montrose, Deep Purple, Zeppelin, Foreigner, Heart, Styx, Rainbow, Kansas, Van Halen, ZZ Top, Boston, Eagles, Skynyrd, Stones, Bad Company, Thin Lizzy and so many more I can’t remember right now, that was 38 years ago. Were you familiar much with Heep and Stephen’s association with them? KK: Uriah Heep was one of my all time favorite bands but, I really didn’t find out Stephen even sang with them until about 10 years ago, guess I was out of touch for a while. Can you give me a short list of some of your favorite musicians / bands / albums / influence from your early days? KK: Pink Floyd, Rush, Led Zeppelin, Deep Purple, Montrose, Kiss, Rainbow, Black Sabbath, Uriah Heep, Doobie Brothers, REO Speedwagon, Fog Hat, BTO, Yes, Steely Dan, Alice Cooper, Allman Brothers, Lynyrd Skynyrd, Kansas, ZZ Top, Foreigner, Bad Company, Thin Lizzy, Blue Oyster Cult, Ten Years After, James Gang, Joe Walsh, Boston, The Eagles, ELP, Zappa, The Beatles and most of the British invasion bands. I was into jazz as well. 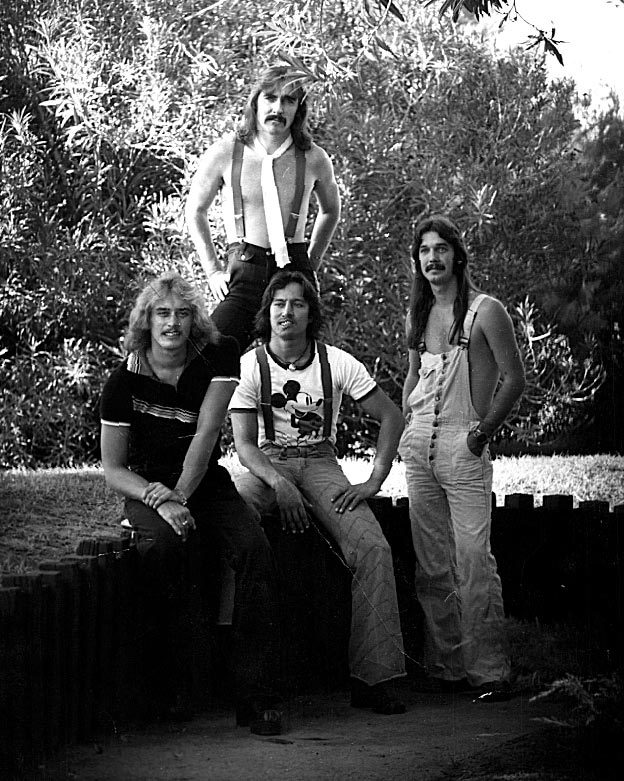 What’s your story of the bands you had in the 70s with Fontaine [Alien and Straight Shooter]? Did you guys play covers or originals back then [a mix]? And was there anything ever recorded to tape back then? KK: Wow, the 70’s, what a blur! 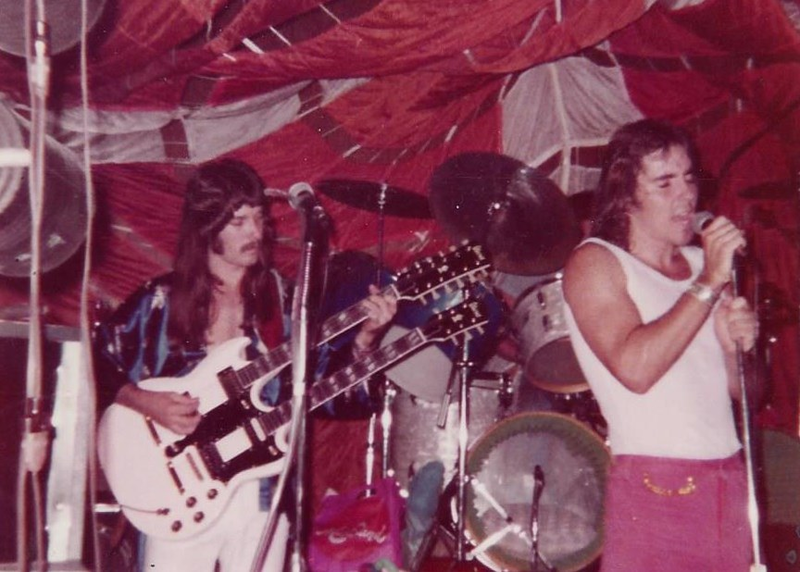 From what I recall, myself, (Kirk Krein) along with guitar player Rick Dickerson had finished playing in a couple bands together when we acquired drummer Frank Micola. Frank and Stephen met in college here in AZ and Frank brought him over. Stephen auditioned for our band Straight Shooter, sounded awesome and instantly became the new lead singer. (none of us remember exactly how or when things came together) LOL. Straight Shooter lasted about a year when we regrouped, forming the band Alien – adding guitarist Craig Frost. We later became the number 1 cover band in Phoenix. Lot’s of member changes happened from 1977 through 1979, especially drummers. Alien was a true cover band, we did fool around with some originals, but not seriously, unfortunately. I believe there were some audience type or rehearsal tapes made back then, but nothing has survived to date, to my knowledge anyway. We didn’t have the money back then to record anything of quality, not even a demo tape, important people came to the clubs to hear you back then. You’ve always been based in Phoenix!? what was the rock scene like back in the day? 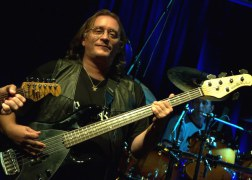 KK: I personally started playing bass in a band back in North Dakota, we were underage, in High School, restricted to the stage and played for about 3 years at bars, clubs, proms and parties around ND, Minnesota and South Dakota ’til I moved to Phoenix in December of 1975. Not sure about the other guys prior history but, for the most part we felt we were a true Phoenix band; all of us were around the age of 18 or 19 when things were heating up. The Rock scene in Phoenix was killer back then. 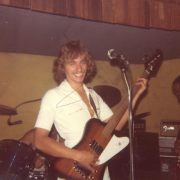 We were playing some of the largest Phoenix clubs six nights a week like the Store West and East with some pretty big crowds yes – there were some really small hole in the wall clubs such as Arnold’s 2×4, Lil Abners, The Zoo, TNT Express, I think one night at the Mason Jar in 78 or 79. They were the best, crazy, crazy fun Times! When disco clubs started popping up (I try not to think about that) it kind of put a damper on things. What level of success did you guys achieve [any highlights]? KK: Alien had a fairly big following for a Phoenix band and we were trying to make a name for ourselves, but we were all kind of young and stupid. One of the bands we rotated club schedules with at the Store West was called BE with drummer Pat Torpe, who went on to play with Mr. Big and many other big endeavors. Our big success story stopped before it got started. Such a bummer. When and why did these bands break up and you got out of music ? KK: When Alien was about to get their big break with a Western US tour and I remember this well, we were playing at a one week gig in a Tucson club called Choo Choo’s Night Train or something like that (can’t remember for sure). Our agent had us staying in a large 10 bedroom house with a bunch of Ladies of the Evening, yeah, shock to me too, the bar patrons would come and party with us every night after closing, lot’s of stories there, but I was good, really I was. That week on a Friday night the Rolling Stones played in town. After they finished, we had a line of people trying to get in the club that went around the block. Anyway, there were some talent scouts in the audience that night, Chuck Wright with Satyr who went on to be the bass payer with Quiet Riot offered Stephen a sweet deal to move out to LA and that was the end of that version of the band Alien as I knew it, no tour, such a bummer. Different versions of the band went on for a while with lots of member changes til it fizzled. I left the band after Stephen did, as we couldn’t find a singer with an amazing voice like his. When did you get back in to the music scene and how did Out There come about? KK: I took a break to raise two boys, married twice, was a photographer and headhunter for many years. Once the kids left the nest and with me being single, I joined a cover band called RoadRage in 2007 where I met lead guitar player Tom Vanderginst. When things went south with that band, I asked Tom to join me at my home studio to start recording original material. After about a year we dubbed the band name ‘Out There’ with the studio being called DreamLand Studios, owned by Kirk Krein. What can you tell me about the band’s previous 2 albums – when were these done, how were they received [locally? ], any press reviews, etc? KK: Our first album was called “From the Beginning” and the second called “Out There”; both were released in November 2013 after several years in the making. We really didn’t know what to expect or how to market them, it was a total learning curve for us, just did it for the fun of it. I did the recording, engineering, producing, lead vocals, harmonies, bass and keyboards, Tom did all the guitar work and Sean Medhi did the drum work. There are some rockers on the Out There album such as Taken Away, No Place To Hide, Time Will Tell, Flight Through Time, Out There, Into The Night, Good Time Tonight, Got My Shades On and Hold On Tight. A lot of people say I sound like Ozzy. Maybe? Had you heard much from Fontaine over the years and how did you end up reconnecting? KK: I hadn’t heard from Fontaine until this past year. I reached out to him in 2013 and he finally responded around July or August of 2014 after he found our web site and heard some of our material. Most of the songs on your new album appeared on the band’s previous 2 recordings without Fontaine on vocals!? How was this song selection done, as opposed to coming up with new material? KK: After Fontaine contacted me, we decided he should listen the tracks on our albums and he should pick the songs he wanted to sing on. He loves ballads and rockers so, hence the reason for the songs on the new album. He had two goals, number one, to prove he could still sing and two, just to enjoy doing it again. It was a cool experience for us too, especially me, having played with Fontaine before! The new Album is called “Out There Again” – kind of a remix of past songs we did mostly from the first album. You’ve included 3 covers – Stealin, Space Truckin, and Love welcome Home [I wasn’t familiar with that one] — why these particular songs? KK: Well, Stealin was my idea, to make a point out there that Stephen still had it together vocally and can still stand up with the big guys, Space Truckin was Steff’s idea, we all love that song and had a blast doing it, Love Welcome Home was Steff’s idea, thinking women out there would love it, plus, it never was a hit back in the day; it was one of the hardest songs to play musically that we’ve ever tried to do. Would you be able to give me a line or 2 about the tracks [aside from above covers] on the new album? KK: Well, as stated before, all the songs were written by Kirk Krein and Tom Vanderginst with a new spin put on them with Stephen Fontaine’s vocals. Apocalypse, Cruzin Down The Highway and RoadKill Cafe are some of my favorites on the Out There Again Album, they all are, really. Stephen just felt these were the songs he could shine on, and he did!. One thing I notice, is you guys include a cool mix of sounds – acoustics, hard rockers, some cool keyboards on occasion, but you don’t tend to stretch out the songs with lengthy instrumental features. Can you kinda explain how songs come about and get put to tape? KK: I guess we could have gone crazy with extended instrumental parts, but we chose not to, in order to keep the overall song time down under 5 minutes. Our recording process usually begins with an idea, phrase or chord progression to start with, maybe only a few seconds long, then I/we scrutinize to put some structure in the overall product, with choruses, lead parts, harmonies etc. things start to flow from there, one track at a time. Then we pick it apart, maybe to much sometimes, LOL!!. Are you guys booking / planning any live shows? Is Fontaine living back in Phoenix? KK: Right now we are trying to discover if people like what we’re doing, it’s been a studio recording endeavor for the most part. We would consider doing a live show or tour in the future should an opportunity come forth and the circumstances were right. Stephen is currently residing in California, and the rest of us, Kirk, Tom and Sean are based here in Arizona, we’ve been sending tracks back and forth and I’ve been mixing them here in AZ. 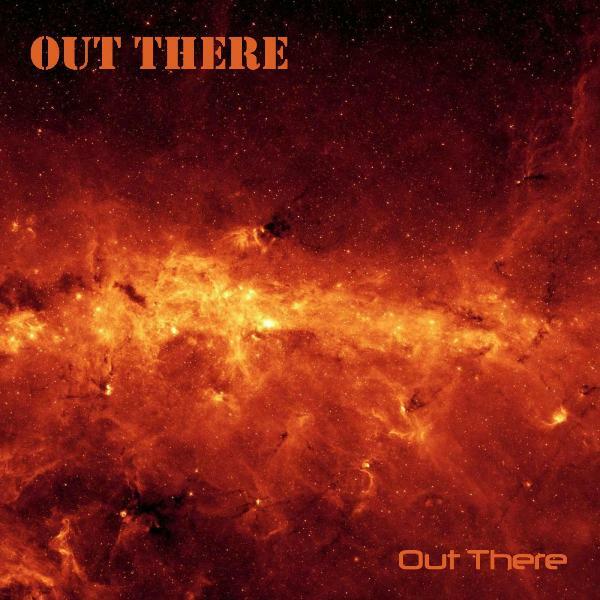 Just an additional note: if you search the web for Out There, search for Out There Tunes or Out There Band, It’s kind of hard to find otherwise.